Real Photo showing a freighter ship. Photo isn't labeled, but appears to be a view looking over the Detroit River with the city of Detroit in the distance. 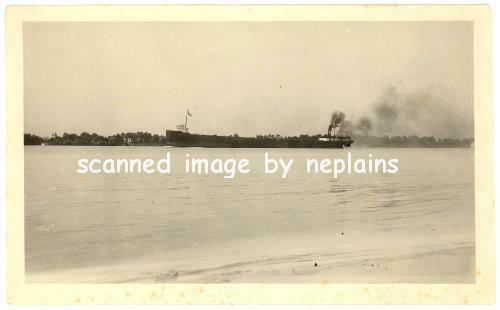 Penciled on back: "A Freighter on Detroit River - Belle Isle - July 4 '22". Measures 5-5/8 x 3-3/8 inches. Slight corner tip and edge wear. Trace foxing at bottom edge.